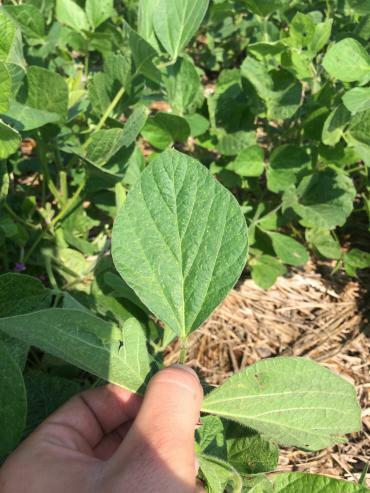 Observations across several counties in southeast and south central Iowa show that, despite some recent rain events and high humidity, twospotted spider mites are persisting in both corn and soybean fields across the area. These insect-like pests can be very difficult to identify, so we’ve got a few points below to help you find them. Mites colonize the underside of leaves in corn and soybean fields, where their feeding results in a stippled or speckled pattern on the upper leaf surface. As damage becomes more severe, areas of the field may be yellowed or bronze. Twospotted spider mites usually move into the field via field edges, especially those near roadsides, drainage ditches, or alfalfa fields. Also, spider mites usually work their way up the plant, so check leaves lower in the canopy for any potential spider mites. Once spider mites are spotted, continue scouting in a V or U pattern into the field, stopping in at least 20 places to check several plants for stippling and spider mite presence. 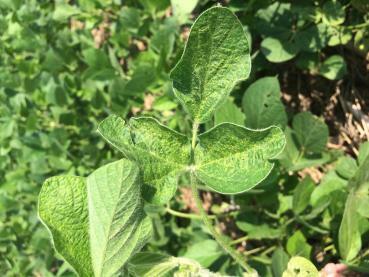 Further into the field, leaf symptoms may not be as obvious but close investigation is necessary to determine if spider mites are present, if leaf stippling is beginning to appear, and where in the canopy the issue is. The soybean leaf shown below has moderate stippling to this leaf in the middle of the canopy. More severe damage will result in a bronzed appearance to leaves and eventual leaf drop. More extensive infestations will have webbing on leaves as well. These are signals to check for two-spotted spider mite presence on those leaves and inspect the field further to determine whether treatment is necessary. A soybean leaf from the middle of the canopy with moderate stippling. It's always important to confirm the stippling is caused by spider mites. Photo by Meaghan Anderson. Soybean leaf with minor stippling. Photo by Meaghan Anderson. 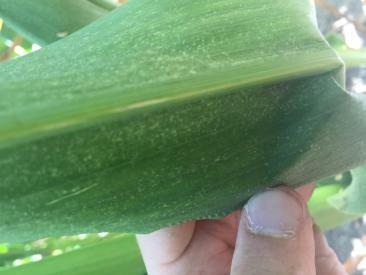 Corn leaf from lower in the canopy with stippling from spider mite feeding. The most significant damage occurs when spider mites feed on leaves at or above the ear leaf. Photo by Rebecca Vittetoe. There are several tactics to try and identify spider mites themselves, as they are very difficult to see with the naked eye. One option is to bring a sheet of white paper, preferably laminated, and tap infested leaves over it. You should see small mites scatter on the paper. A second option is to use a hand lens or a cell phone macro lens to get a close up view of the leaves. 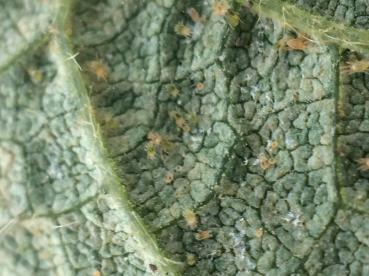 A cell phone macro lens close-up of spider mites, eggs, and cast skins on the underside of a soybean leaf. Photo by Meaghan Anderson. 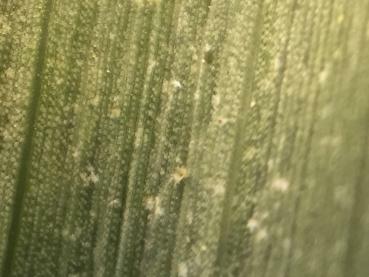 Close-up of spider mites on the underside of a corn leaf. Photo by Rebecca Vittetoe. Thorough scouting is the first step to determining if management is necessary. To learn more about the life cycle and management options for this pest, read Erin Hodgson’s related ICM News article here.